An excellent location for overseas trade with an extremely low cost of living, could this Humberside City of Culture make your start-up soar? Why start a business in Hull? Nestled in the North East’s Humber estuary, Hull is amongst the busiest port cities in Europe, offering excellent export opportunities with the continent through its low-cost ferry links. The city is also a hotbed for green and renewable energy, with plans to build a wind turbine manufacturing plant and 12.5 waste-to-energy centre currently underway. With an extremely low cost of living (see below), Hull represents an attractive option for low-carbon energy start-ups and digital businesses looking to trade internationally. You can expect additional business support and increased business activity this year too, given that Hull was named the UK City of Culture 2017. Following the government’s 2015 Autumn spending review, the city’s Enterprise Zones are to receive a significant boost, expanding to include additional employment land, and to stimulate investment in improving the quality and availability of office and industrial space in the city. Whilst it is not the most central of places, Hull benefits from good transport links, both within the UK and to overseas locations. The aforementioned ferry links connect Hull directly with ports in Holland and Belgium, and there are eight rail services a day running directly to London, which take two hours and 40 minutes. The city is served by two airports – Robin Hood and Humberside, both within an hour’s drive of Hull. Road speeds in the city are slow, however, at just 16mph on average. The M62 motorway provides access to other Northern cities including Manchester, Liverpool and Leeds – though it ends someway from the city’s boundaries. Hull has just one university – The University of Hull – but it is fairly well-regarded, consistently ranking in the top 70 universities in the country across multiple tables. Businesses in the area will be able to take advantage of the various business and enterprise programmes the university runs, which include help and advice on starting a business and access to expertise through its Knowledge Exchange initiative. Hull University claims its global economic impact amounts to £591m a year, with £472m going into the local economy. The University also has a Logistics Institute, which claims to be a “world class” centre of excellence in global logistics and supply chain management. Established in 2005 with £20m of funding from Yorkshire Forward, the centre offers a number of training and support services to help local businesses with logistics. Hull has one targeted accelerator programme for tech business; C4DI (Centre for Digital Innovation) based at the Fruit Market new tech accelerator programme which provides support to start-ups and has created partnerships with corporate brands such as Amazon Web Services and PWC. Where Hull comes into its own is the Humber estuary’s enormous Enterprise Zones. The Humber Renewable Energy Super Cluster Enterprise Zone, together with the nearby Green Port Corridor Enterprise Zone, have a long pedigree in green engineering and energy businesses. The Zones hope to attract more businesses to both banks of the river, both large and small, and offer a range of benefits to businesses wishing to locate there, including enhanced capital allowances, discounted business rates (up to £317,548 (€400,000) over five years), superfast broadband, access to the Humber’s Regional Growth Fund allocations, and more. Sites along the banks are large enough for the assembly of large structures. Despite the presence of the large enterprise zones in the area, smaller tech businesses are not exactly spoilt for choice when it comes to specialist office space. The nearest science park is actually in York – over an hour’s drive away – and co-working spaces outside C4DI’s offering are thin on the ground. If you don’t need specialist facilities, you have a range of options when it comes to office space. Office areas in the city centre include the waterfront business district of Humber Quays – with RBS, PricewaterhouseCoopers, and Barclays among the area’s tenants – and the historic Fruit Market, home to a lively and growing cultural scene. Outside the Enterprise Zones, there is also ample development space along the main route into the port of Hull. 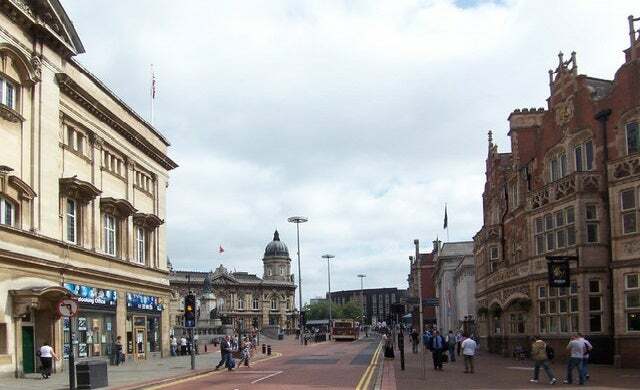 In terms of direct grant schemes, the owners of businesses in Hull are somewhat limited in their options, although there is a good spread when it comes to other forms of finance. The Regional Growth Fund is the only scheme providing ‘pure’ grants to entrepreneurial businesses based in the area, with £65m allocated to the Humber region – some of which will take the form of grants. More information can be found here. For young aspiring entrepreneurs (up to and including 19 years of age), the Youth Enterprise Bank initiative provides small grants of up to £1,000 to help make their business idea a reality. The scheme’s creators say eligible ideas should benefit other people or be “enterprising” in general. Elsewhere, Finance Yorkshire is a long-standing and prolific investment fund providing business loans, seedcorn finance, and equity-linked finance, in various amounts ranging from £15,000 to £2m. Sirius also provides business loans to local people seeking to establish a business in the area, as well as advice on all aspects of the start-up process more generally. For businesses unable to raise finance from traditional sources, the Acorn Fund (recently renamed the Hull Business Development Fund) may provide some recourse – loans for local businesses are available in amounts ranging from £1,000 to £25,000. The funding will only be allocated to projects which are capable of producing and/or safeguarding jobs, and providing a “sustained benefit” to the local economy. As with the rest of Yorkshire, YABA (Yorkshire Association of Business Angels) is the predominant angel network in the region. More than 140 angels are part of the organisation, which typically invests amounts of up to £300,000. Once considered amongst the most deprived areas in the country, Hull has risen from the ashes of its post-industrial decline to be recognised as a booming centre for culture. In 2013, it was announced that the city would be the 2017 UK City of Culture, which will see it undergo an £11m government-funded redevelopment and host a number of events across the city. Those choosing to start a business in Hull or the surrounding area will benefit from a relatively low cost of living – house prices stood at £166,519, though this is a sharp increase from the £72,255 on average for the year ending September 2015. However, although it has dropped in the last year, the crime rate per 1,000 people is at 101.94, significantly higher than average. Hull features a range of entertainment options, tourist attractions and drinking & dining venues. Trinity Open Market in Hull’s Old Town is a popular place go on the weekend with Oscar’s bar and King’s bar nearby. For more lively things to do, you can visit the roller disco at Bridlington Spa or watch shows and comedy acts at Hull New Theatre. If it’s food you’re after, 1884 Dock Street and Kitchen and seafood steakhouse Trattoria Tredici, both situated on Hull marina, are local favourites.